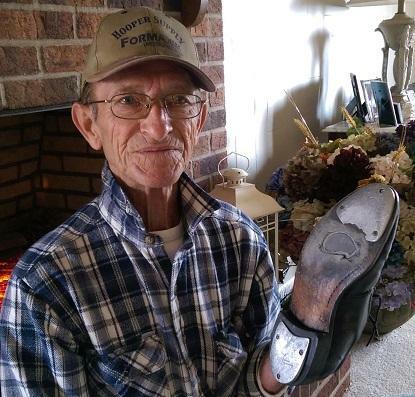 Thomas Maupin holds up one of his dancing shoes, to show how years of Buck Dancing have worn down their steal tap plates. EAGLEVILLE, Tenn. (WMOT) -- The National Endowment for the Arts acknowledged this week what traditional music fans have known for some time; mid-state Buck Dancer Thomas Maupin is a national treasure. Maupin is one of the few remaining practitioners of Buck Dancing, a style related to Irish Step Dancing. With the NEA recognition, Maupin is now listed among the 2017 National Heritage Fellowship recipients. Interestingly, Maupin doesn't consider his Buck steps dancing, but rather a form of percussion. He see his feet as just another instrument in the band. To ensure that traditional buck dancing isn’t lost to future generations, the 79-year-old Maupin has taken on an apprentice. Courtney Williams is a student at Middle Tennessee State. The NEA will fly Thomas Maupin to Washington mid-September where he’ll receive his award and will get a chance to show-off those unique Tennessee dance steps.